I’ve been a fan of contemporary romance since I was 14 years old. 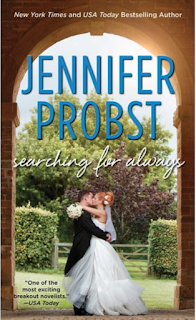 Jennifer Probst is one of my top three favorite authors in this genre. Jennifer’s recent release, Searching For Always had me smiling from beginning to end. As a yoga teacher I’ve been dying to hear Arilyn’s story, and it did not disappoint! Probst takes her readers on a journey full of life, every situation in the book is something that could happen to you, or a friend. Searching For Always has the perfect blend of pain, love, and growth all mixed together to create a beautiful love story. There is no unnecessary drama; you won’t be rolling your eyes at that things don’t make sense. Everything that takes place in this story is for a purpose. I think this is the perfect book to read over the summer while you're basking in the summer heat, and dreaming of love. If this sounds like the book for you- enter the GIVEAWAY below! Thanks for giveaway chance! I love Jennifer's books! Sounds beautiful. Thanks for the giveaway! !